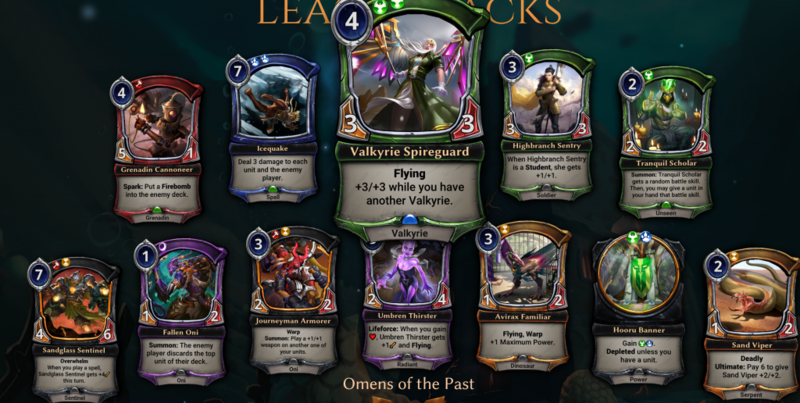 I was pretty happy about my sealed pool through the first two weeks of action, despite opening some real lackluster packs in week two. When I left off, I was 17-3 and ranked about 20th. A solid start, but the wheels can always come off in such a long tournament. One run of bad luck and you’re back down in the hundreds. I’m going to be traveling for basically the entire month of June, first to France, then Switzerland, then back home for a week, then on to Santa Fe. I have no idea how much time I’ll have to play or write, so I may not put up an article every week (as if I was meeting that goal in the first place…). With that in mind, I’m going to wrap up the May sealed event in one go. Now we’re talking. Valkyrie Spireguard is a slam-dunk, grade-A bomb. A 3/3 flyer for 4 is already very strong, but a 6/6 is absurd! I had multiple cheap valkyries to pair with it, so she was almost always a 6/6. Outside of Set 1 (of which there were only two packs), there were very limited ways to deal with her. She did get silenced here and there, but once again, the fail case was a 3/3, which is just fine. Other notable cards were Tranquil Scholar, Sand Viper, Avirax Familiar, Strength of Many, Hooru Stranger, Hooru Banner, and Talon of Nostrix. The stranger and banner were obvious inclusions in my 4-faction greedpile, which made Pteriax Hatchling into an easy splash. Strength of Many was a good replacement for at least one of the Ironclad Oaths, as it is often just as powerful for half the cost. Tranquil Scholar is a fantastic 2-drop for a deck like this that wants to play the long game. Sure, occasionally he rolls reckless (hot tip: You can actually decline to give the ability to the card in your hand), but sometimes he rolls Revenge and you give it to your Pteriax Hatchling, which you then trade off and then hit with a +6/+6 from Roosting Owl, resulting in free 8/7s. Sand Viper represented a much-needed way to deal with larger threats on the ground, as well as guaranteed trades against an aggressive draw. Avirax Familiar would help me ramp toward my bigger bombs and possibly provide a little card advantage to go along. Talon of Nostrix is a decent card, but it just didn’t fill enough holes in my deck to warrant the risk of drawing it late when it was no longer relevant. I couldn’t find anything I wanted to cut for it, so I left it on the bench. 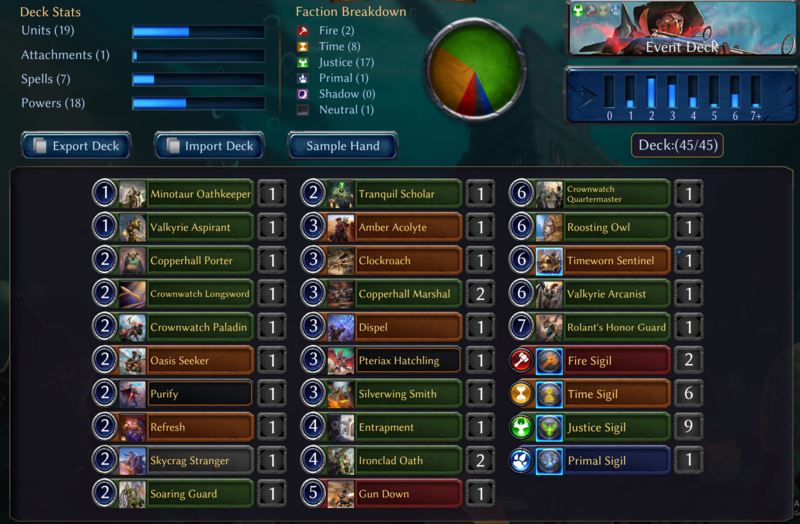 The cards I cut were Crownwatch Longsword, 2x Ironclad Oath, Oasis Seeker, Minotaur Oathkeeper, and Copperhall Marshal. These were all pretty obvious swaps, except for Oasis Seeker and Oathkeeper. It came down to him or Crownwatch Paladin. After playing weeks 3 and 4, I actually think I should have cut the Paladin. I just didn’t have the tools to help her attack more than once. Even when I had her on turn 2, she usually just traded after a single attack. With very limited interaction in my deck, I never wanted to burn one of my few tricks or removals on their 2-drop, so I was forced to just take the trades. That’s fine, generates warcry value later in the game and all that, but Oasis Seeker’s extra power is much more relevant when you don’t draw him on 2, plus he’s an explorer to help trigger Timeworn Sentinel. If I could do it all again, I would have made that swap. Minotaur Oathkeeper is a very good card if you’re looking to attack. 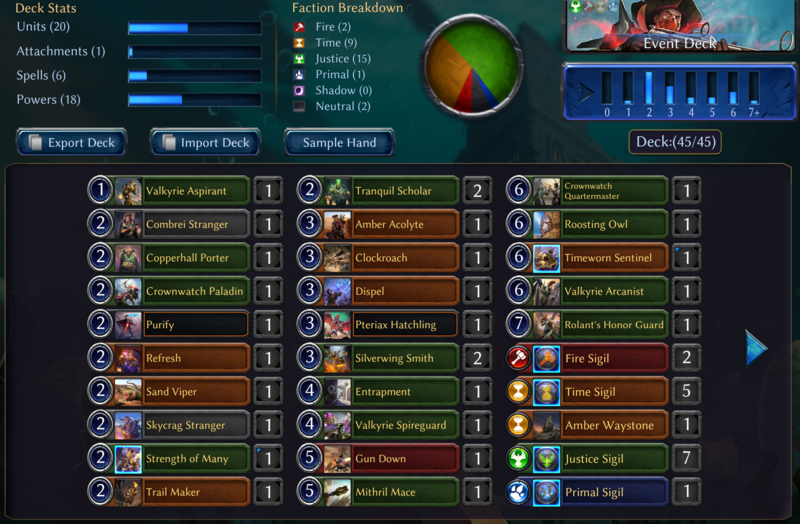 Problem was, all of the cards I wanted to attack with were either huge (Quartermaster buffs, Honor Guard) or didn’t get a large amount better from +1/+1 (Pteriax Hatchling would still trade with almost anything; plus I was likely to have two of those). I was really just looking to block and extend the game. Oathkeeper doesn’t help you do that at all, while also being a very low-impact card later in the game, so I cut it. The other cards were among the weakest in the deck. I wasn’t aggressive enough to take advantage of the Longsword tempo, and the risk of being blown out was too high. Even with Spireguard in the deck, Soaring Guard is still just a 1/2 and a miserable topdeck as a result. Copperhall Marshal is a nice card, but I just didn’t have the weapons for her. Ironclad Oath is a fine trick, but it’s super clunky, and my deck had enough beef at the top end that I decided I would rather streamline things. Note: Apologies for the spoiler tags; the new version of WordPress seems to have broken the plugin I was using. I’ll fix it when I can. The deck hummed on all cylinders. I even won a game where I was stuck on 2 power until turn 6. Even in the ranked game I lost, I was able to do my thing, and I probably could have won it with a few different lines. I under-estimated my opponent’s explosive capability and wound up being too conservative with my Rolant’s Honor Guard. I waited a turn too long to deploy it, and they put me into a situation where I was forced to trade it off for a giant flyer. I had Quartermaster in play, so if I got a turn with full power, I could have activated the Quartermaster for +5/+5 and had an 11/11 lifesteal to put the game away. Instead, I had to trade and wound up not being able to overcome their air force. In the dark, I’m not sure if I made any mistakes necessarily, but the lines I did take wound up punishing me. After that stellar performance, I was in 4th place after week 3! I started to regret those missed tiebreakers (curse you, internet! ), but at 26-4, I had a real shot at taking this thing down. Before diving into week 4, I must say that I was very nervous about the final stretch. My deck in the previous weeks was easily able to overpower my opponents, many of whom were still missing key pieces that they had to fill with subpar cards. Every card in my deck through the first few weeks was very solid, so I had a big leg up. With the final two packs coming from Set 1, which is by far the most powerful set, I foresaw that gap closing significantly. Even if I got some upgrades, I would likely be nudging a few of my cards from C to C+, while my opponents would be upgrading D- to C+ at the same time. Though I’m happy with how my deck is set up, I figured it was unreasonable to expect to 9-1 easily again, and I would have to get a lot more lucky in the games to pull that off. The notable cards here are Striking Snake Formation, Combrei Stranger, Elysian Banner, Find the Way, and Mithril Mace. Once I swapped a Time Sigil for the Elysian Banner, Combrei Stranger was an easy swap for Hooru Stranger. I actually had plenty of Primal sources, but it was critical that I hit Time early in the game. I had enough fixing in the deck that I don’t think it was necessary to play all three strangers. Skycrag and Combrei were enough. I know I talked bad about Talon of Nostrix, but Mithril Mace is a much better card. Talon is almost never going to do better than a 1-for-1, but it’s not too difficult to engineer situations where Mithril Mace gets to eat two things, and better things at that. I definitely wanted to find room for it. Find the Way might seem like a slam dunk for a greedy powerbase like mine, but I actually decided not to play it. It is super slow. Like, glacial. At this stage of the league, I expected aggressive strategies to be a lot more prevalent than earlier-on, since people were a lot more likely to reach a critical mass of good, cheap threats. Had this been in my initial Week 1 pool, I certainly would have played it then, but I don’t think I was actually that desperate for fixing to the point where I would effectively spend 6 total power to draw two sigils of my choice. I’d rather be affecting the board with my fixers (strangers, Trail Maker, Amber Acolyte). Finally, let’s look at Striking Snake Formation. Some people believe this card to be a huge bomb; others are more cautious about placing it in the right deck but recognize its power. It’s a fantastic card in the Time-based midrange strategies full of Seasoned Spelunkers and Striped Araktodons and Towering Terrazons that get to munch through your opponent’s stuff. I did not have not that deck. I had a large number of small value creatures and dorky flyers backed up by some big bombs. I didn’t have any of those middle-of-the-road cards that SSF works well with. I don’t want to give my Pteriax Hatchlings killer so I can trade them with my opponent’s Strangers. I don’t need Rolant’s Honor Guard to have killer 95% of the time. So I left my sweet rare to ride the bench. I should be overjoyed–and I am, mostly–to finish with that kind of record. At 34-6 and 53 tiebreakers, I am sitting in 6th place. But damn, I started 5-0 this week and started to really think I might hit that #1 spot. Sadly, I dropped 2 of the last 5 to some really absurd decks/draws. Really, props on that second Talir’s Intervention to eat my Rolant’s Honor Guard with your Monolith Guardian–I was not expecting that at all! After playing my tiebreakers, I briefly moved into 5th, but I was leapfrogged shortly after. I’ll never know if those 8 missed tiebreaks would have been good enough to put me in the top 5, but I suppose I’ll just have to settle for a top-10 this month. Much better than last month, at least! 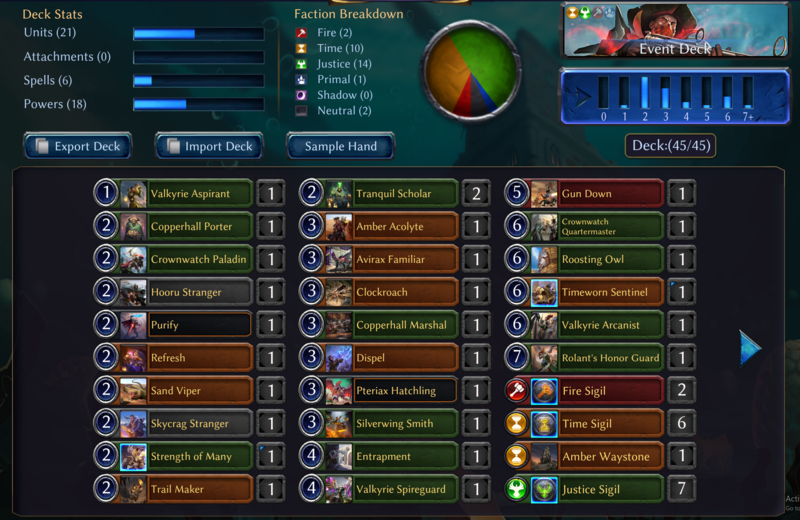 My final record with this deck, including tiebreaker games, was 87-25 (~78% winrate). I did significantly better than that during the ranked matches (85%), which can both be attributed to some luck and to the fact that I did put a lot more effort into winning those. I would take breaks after particularly intense games, and I will admit to drinking while I played my tiebreakers. Still, I can only recall one, maybe two games that I really felt I punted. The other losses were either to superior decks, or to me taking lines that did not pan out, but were not necessarily wrong, given the information I had. Remarkably, I only got power/faction screwed a couple times. This deck was very good at coming back if I missed some power drops, as it was full of solid 2-drops to contest the board. Of my 27 non-power cards, 10 were from Set 1, 9 from Set 2, and 8 from Set 3, even though we got two extra packs of Set 3. It’s a bit of a shame that Set 3 is so underpowered compared to the rest. I wish they had tinkered with the balance a little bit for next month, but the June league will use the same format as this one, sadly. Not bad for 12,500 gold! Here’s to hoping next month’s pool is as great as this one was!